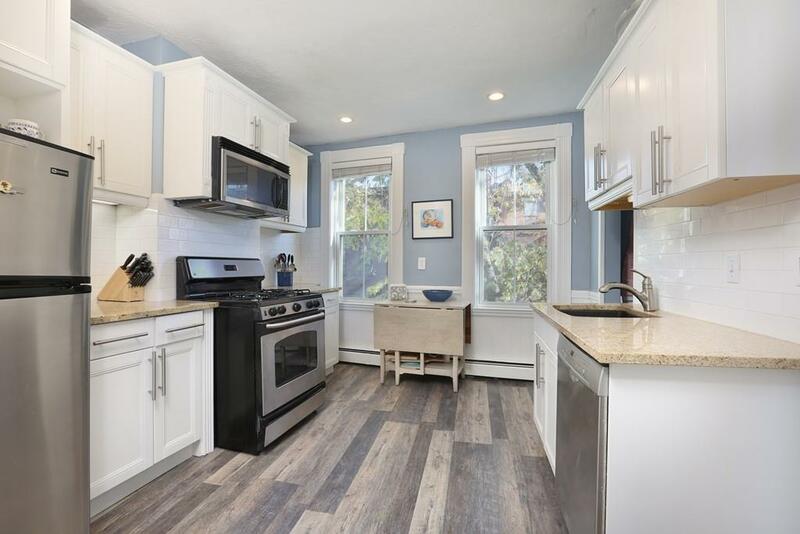 Located on one of Charlestownâs most desirable gas lit streets & steps to the best restaurants, shops & the âTâ, this sun filled one bed + penthouse has soaring ceilings, abundant natural light & newly renovated kitchen and bath! The eat-in kitchen has tall white cabinetry, ss. appliances, granite counters adorned w/white subway backsplash & new floors. A large pantry closet allows for ample storage. Spacious living w/wide pine floors & deep closet for storage. Elegant dining sits directly off living & can fit a large dining table. Serene master bedroom boasts natural light fr. windows on 2 sides incl. bay window, hard wood flooring & large walk-in closet. The + room serves as the ideal home office. The just renovated bath has new flooring, white vanity & tub/shower w/tile surround. Serene roof deck w/views of the city skyline & monument is located 1 flight up w/direct access fr. the unit. With in unit w/d, basement storage & sought after location, this is the 1 you have waited for!